InterContinental Los Angeles Century City at Beverly Hills is underway with a redesign and upgrade to all of its 363 guestrooms and suites. The multi-million dollar project, set to be complete in 2016, brings new accommodation types, including two new suite categories, and welcomes a fresh take on a more modern, luxury California-inspired look and feel. 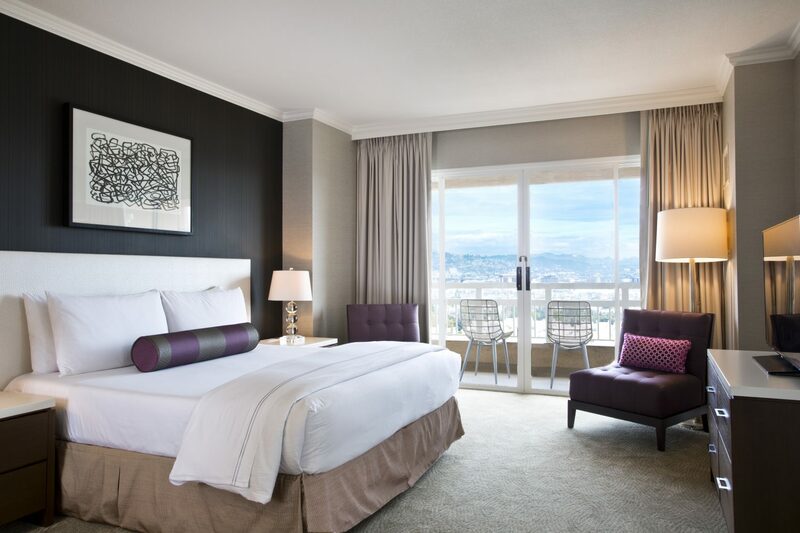 The iconic hotel offers a range of spacious guestrooms and suites to accommodate any type of traveler, all with private outdoor balconies or terraces. As part of the renovation project, the new, expansive Elite Honeymoon Suite is added to the roster of room categories. 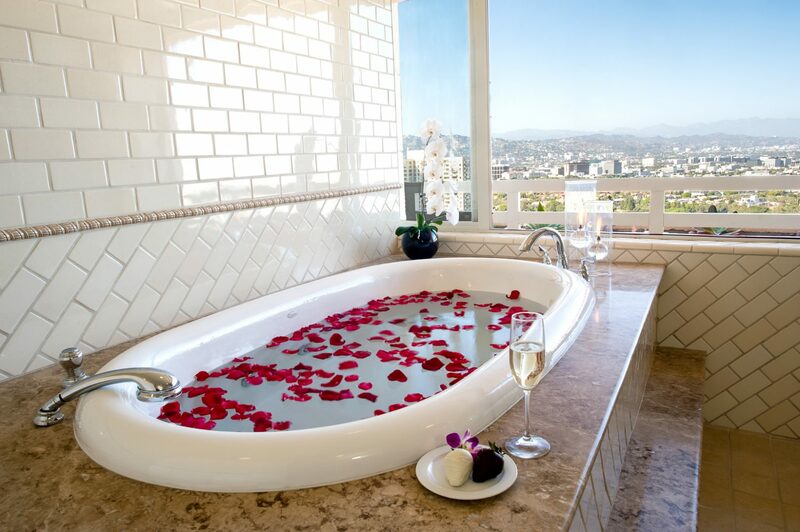 Perfect for a romantic getaway, the 1,325-square-foot suite features an oversized soaking tub with French windows above that open into the bedroom, offering uninterrupted views, beyond the balcony to the Hollywood Hills. The suite also has a separate living and dining area, powder room and kitchenette with an island and barstools. Each room features modern furniture shapes rendered in rich wood veneer. With relaxation in mind, the final touches include a palette of wood surfaces, neutral fabrics and soft goods. The layout invites guests to relish the impressive views of Hollywood, Downtown Los Angeles or the Pacific Ocean from each room’s private balcony or terrace. Elegant upholstered headboards and crisp white bedding with down duvets add to the hotel chic. For some sparkle, the designers added crystal columnar lamps to the bedside tables and judicious pops of color with geometric and striped accent pillows in tones of amethyst, plum and chartreuse. A series of abstract ink artworks by Kim Johnson adorn each room. Every luxurious bathroom features separate walk-in showers, a soaking tub and fine lemon verbena-scented bathing amenities from Agraria. Other suites include Studio Suite with a separate working area, Deluxe Terrace Suite with spacious outdoor terraces, One Bedroom Executive Suite, One Bedroom Premier Suites with balconies and terraces, and One Bedroom Elite Residence Suite, which is perfect for extended stays given its large footprint and comfortable layout. The hotel’s top accommodations are the Presidential Suite and 3,300-square-foot Royal Suite, which includes two bedrooms, two-and-a-half bath, library, full kitchen and wet bar, two LED fireplaces, double walk-in rain shower and whirlpool soaking tub, as well as dramatic LED lighting to change the color and mood at any time. The redesign to all guestrooms and suites follows the hotel’s renovation to the ground-floor meeting space, including the 4,000-square-foot Grand Salon Ballroom and expansive foyer, as well as the Lobby Lounge, in 2012. The Royal Suite was upgraded in late 2013. A new spa and restaurant concept are also in the works. For more information and make a reservation, please visit: click here.